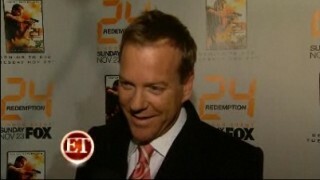 24 Redemption cast members Hakeem Kae-Kazim, Tony Todd, Cherry Jones, Kiefer Sutherland, Jon Voight, and Robert Carlyle were interviewed by FoxSource on the red carpet and tease what’s in store for 24 Redemption. [..YouTube..] Tony Todd looks pretty scary! o.O Best role for him. [..YouTube..] This is an historic day… You mean “a” historic day?